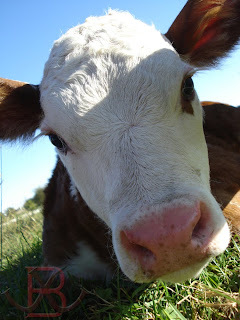 Well I missed posting calf pictures yesterday so today I will give you two! All is well around the farm, I got the sale bulls in last night and rinsed and clipped on one for a little bit. 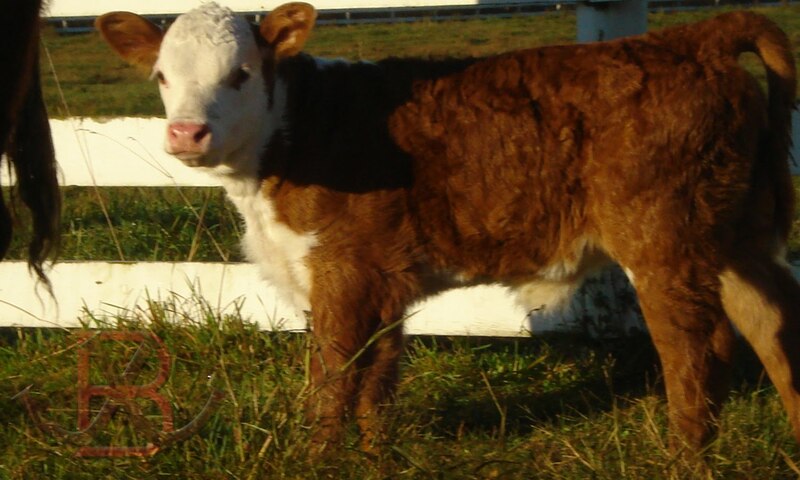 These bulls look really nice and one should be a stand out come February… I guess we will just have to wait and see! But now on a serious note I have not come up with a good name for this heifer yet! It usually doesn’t take me very long but this one is giving me trouble. Anyone have any good suggestions??? If not that’s fine,enjoy your day and enjoy the pictures of the heifer! Yesterday morning around 11:00 the last fall calf was born at JJB Cattle Company. You may be thinking to yourself, “The last one heck he just had the first one.” Well there are only two fall calving cows on the farm but it was a long wait and I’m glad it is over. Both mother and baby are doing well. The heifer calf was born unassisted and was very motivated to get up and get her belly full. Since she was so aggressively trying to get up I just let her do her thing yesterday and waited to weigh her this morning. When I got her on the scale she ended up weighing a 95 lbs. which is not too bad would have liked for it to be down to 90 and ideally 85 but since she was unassisted I can live with it. No name for her yet but you will be seeing a lot more of her. She wasn’t too sure what to think of this camera…. she is going to be seeing a lot more of it! Finally….. A Calf Is Born! Have been waiting for a long time and finally the first fall calf has been born! It is a heifer calf and she was born yesterday afternoon around 4 o’clock. 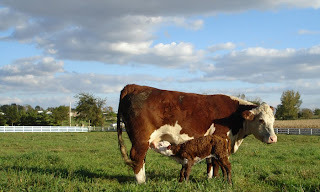 Both calf and mother are healthy and happy. The heifer even got right up and went to sucking without assistance (everyone’s favorite). I snapped a couple of pictures of her as well. Hope you enjoy! As the title of the post says there are still no fall calves born at JJB Cattle Co……. Seems like I have been waiting forever and patience is running thin. Guess I will have to just keep on waiting. Anyway since I don’t have anything really exciting to post I figured I would take a picture of Max Cherry’s June steer that is at the farm waiting to be weaned. Really like this steer and wish I had kept the bull that he is out of at this point but those are the breaks I guess. My grandfather has always told me to surround myself with good and successful people and that it is a good thing to admire people that are successful and to try emulate them…. The video below is close to an hour long but if you have the time be sure you watch it. It is amazing to me to see two of the most successful men in the world from the most completely different backgrounds and careers to have so much in common. Jay-Z and Warren Buffett have seen it all, done it all. I can not stress enough how awesome it was for me to watch this video and listen to these two icons speak! Well the sale season started a little bit ago so I figured I would post some info on a bull I am lucky enough to own a part of that is in the Star Lake Fall Sale. He is out of the Lucky cow that I mentioned in the previous post and the S109 bull that has sired some really fancy calves at Star Lake. Hope you like him… I sure do. Had a really good weekend at the farm and got a bunch of long standing projects done. The biggest of which was getting the sand moved into the barn. I had been using the standard wood shavings as bedding but there was just too much of a mess to deal with. So I began to look at the message boards and asked around to find a better alternative. One solution that kept coming up was sand… And I just so happen to have a whole lot of sand. You see there was once an indoor riding area at the farm (now we use the arena for equipment storage which is just fine with me) so I have this mountain of free to me sand! The only downside I have been told is the amount of time that is spent blowing the sand out… But under the JJB method of cattle prep they don’t spend too much time in the barn anyway so the more blowing while they are in the better! I also got the barn cleaned up and it is starting to look nice again. Since the last update there has not been a lot of excitement for JJB Cattle Co. there has been a bunch of mowing and a few halters being taken on and off but mostly a whole lot of waiting. There are only two fall calving cows on the place and they have looked like they are about to calve for close to two weeks now. Well since my last post another Iowa State Fair Hereford Show has come and gone. This year the weather was better then normal and the cattle were extremely exceptional. Last year the judge kind of beat around the cattle that were over conditioned and this year it seemed most of the exhibitors had taken note. The cattle were much fresher in their appearance and that is a good thing to see. I took a Polled heifer and a Horned bull to the show and they didn’t look half bad. The heifer had some bloating issues the week before the show and wouldn’t you know it on show day… the air was back. We got the bloat taken care of but there was no way to make her full enough, those are the breaks I guess. She still got second in class and I received more compliments on how she looked this year then I did last year when she was the Reserve Grand Champion. I guess you don’t have to win to receive praise. The Horned bull was my big challenge. We had to walk from the new stalling barn down to the showing pavilion right past the arriving 4H exhibitors. This was my bulls first time off the farm and it got a little hairy at times but in the end all was well and he walked out of the ring with a light purple banner hanging from his horn. This was by far one of the best state fairs that I have attended and it seems people could recognize all of the hard work that was put in. Now it is back to the real world and mowing pastures and rotating pastures. The next big stop for JJB Cattle Company will be the Iowa Beef Expo in February and even though this is a ways off the preparation has of course already begun. I will be breaking the heifers that I hope to take to the Expo this weekend and hopefully have their first pictures to show you sometime in the next two weeks. I will leave you with a video of the cows getting turned out into the creek pasture. 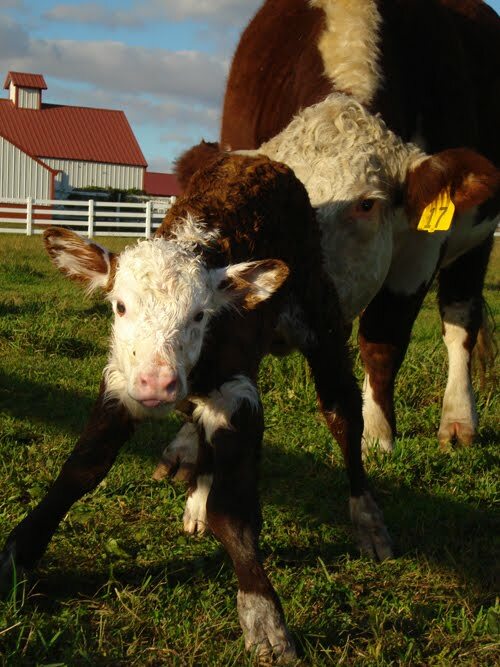 You might also notice a little June calf running out with them… There is sure to be more on that little guy later.